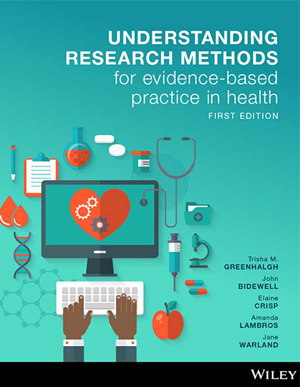 From heavyweight health author Trisha Greenhalgh and an all-star team of Australian contributors, the first edition of Understanding Research Methods for Evidence-Based Practice (EBP) in Health is the only resource tailored specifically to align with the most common topics in a 12-week evidence-based practice unit for Nursing and Allied Health courses. 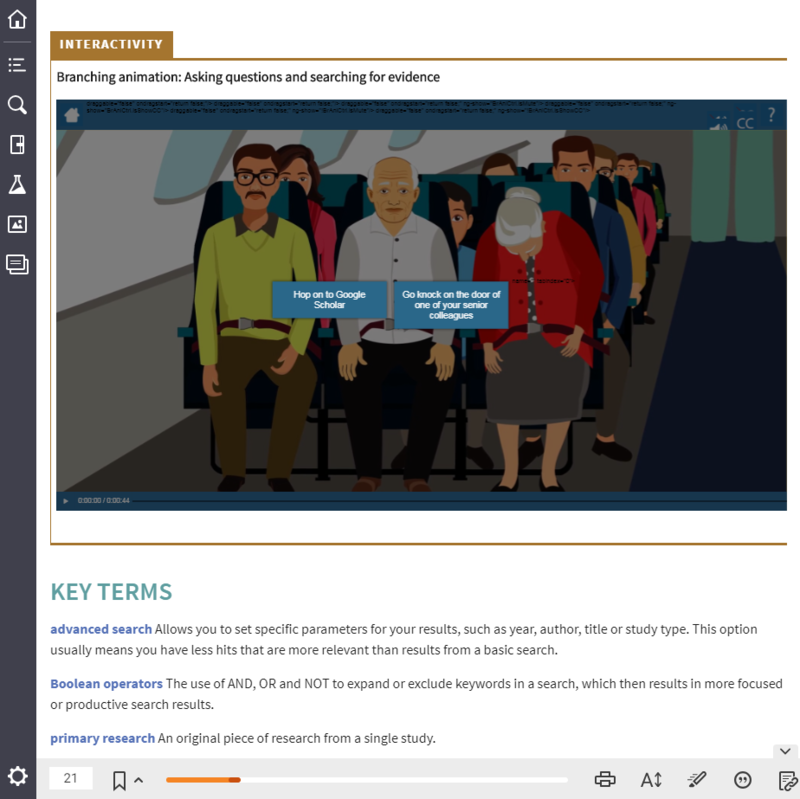 Comprising insightful and engaging content, this resource is unique in its focus on consumers of research – keeping students focused on the skills most relevant to them. Unlike many existing evidence-based practice resources, this first edition is designed specifically to align with the most common topics in a 12-week evidence-based practice unit in undergraduate Nursing and Allied Health courses. 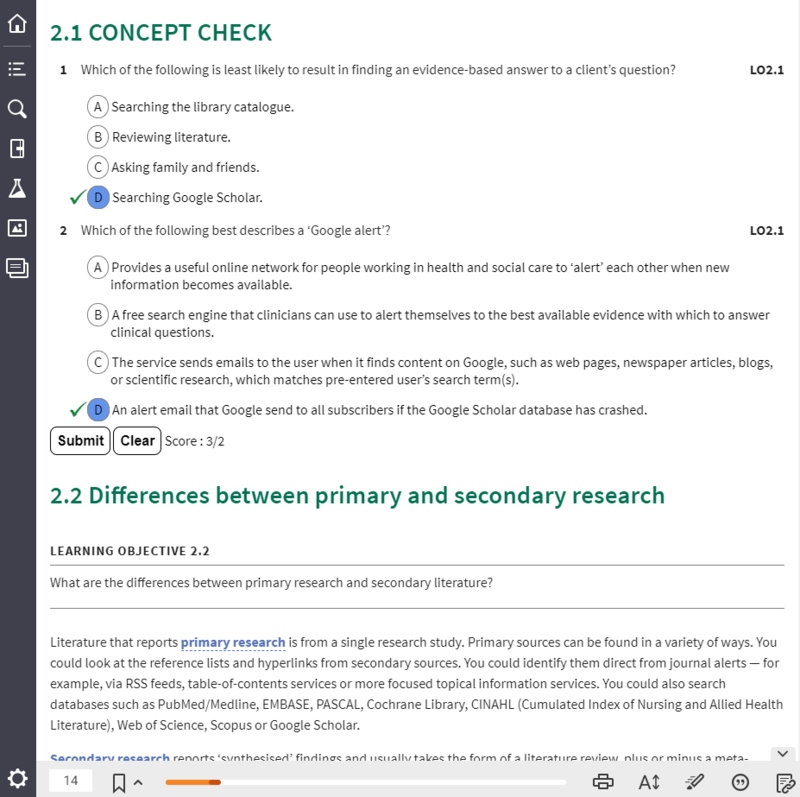 Greenhalgh’s first edition is focused on consumers rather than producers of research, to keep students focused on the skills most relevant to them, such as synthesizing secondary research for clinical practice. 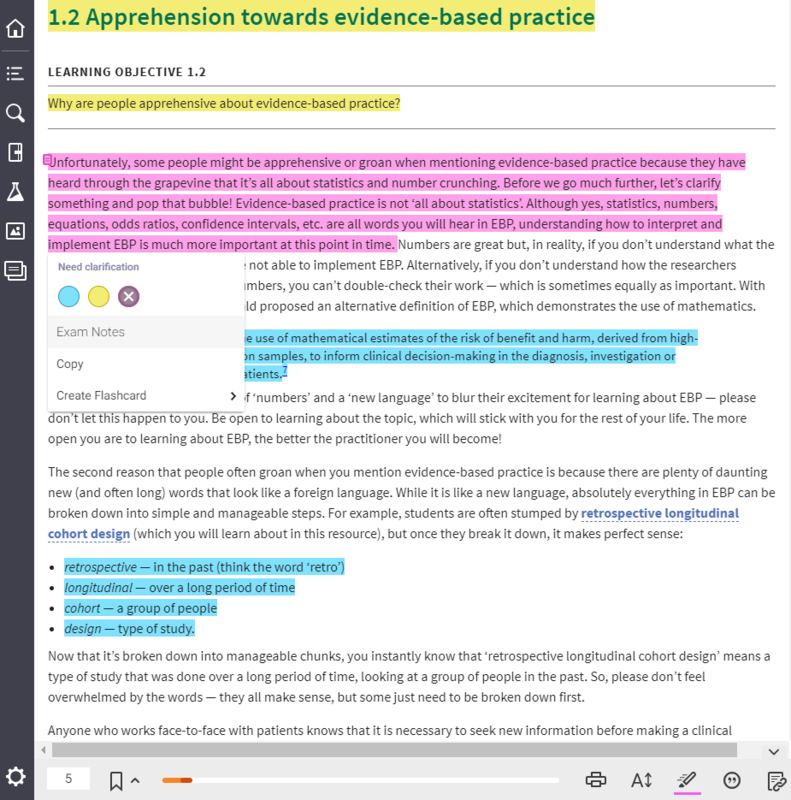 This first edition comprises insightful and engaging content delivered in concise, digestible chunks to support students’ engagement and retention. 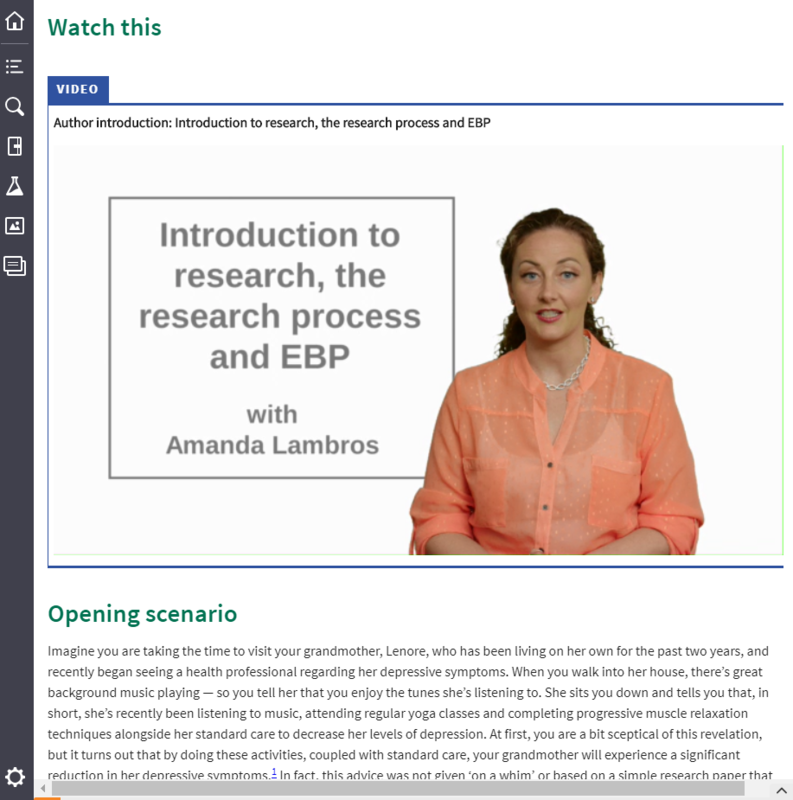 Now available as a full colour printed textbook with an interactive eBook code, Understanding Research Methods brings Evidence-Based Practice to life and provides students with a rich and engaging active learning experience. Dr Trisha Greenhalgh is a Professor of Primary Health Sciences at the University of Oxford and a practising GP. She completed a BA in Social and Political Sciences at the University of Cambridge in 1980 and a medical degree at the University of Oxford in 1983. Trisha’s research aims to apply the traditional aspects of medicine while embracing the opportunities of contemporary science to improve health outcomes for patients. She is the author of more than 240 peer-reviewed publications as well as a number of scholarly textbooks. Trisha has received numerous accolades for her work, including twice winning the Royal College of General Practitioners Research Paper of the Year Award, and receiving the Baxter Award from the European Health Management Association. In 2001, she was awarded an OBE for services to evidence-based medical care. Dr John Bidewell is a Lecturer in Research Methods at the School of Science and Health at Western Sydney University. From an early career in school-teaching, John moved into psychology, acquiring three degrees while always maintaining an interest in education. Opportunities arose in applied social research and data analysis, leading John in that direction. For many years, he provided technical and inspirational support to academic and student researchers, covering every stage of the research process from concept to publication, and especially data analysis and interpretation, at Western Sydney University’s nursing and midwifery school. 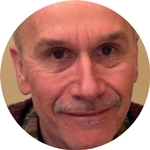 John has provided consultancy services in research and statistics to business, industry and governments, and has taught research methods and statistics to nursing, business and allied health students at undergraduate and postgraduate levels. 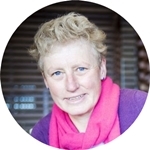 Dr Elaine Crisp is a Registered Nurse and Lecturer in the School of Health Sciences at the University of Tasmania, where she coordinates both the research Honours and clinical Masters courses. This dual role highlights her belief in the importance of the connection between research and clinical practice. 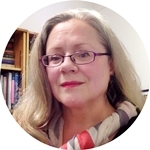 She has also taught research methods to nursing and allied health students at both undergraduate and postgraduate levels, encouraging clinicians to understand and use research evidence in their everyday practice. Elaine worked as an RN in aged care and in the perioperative area before commencing her PhD, which combined her love for history and nursing. Her major research interests are nursing and welfare history, dementia care, and nurse education. Amanda E Lambros is a Clinical Fellow in the Faculty of Health Sciences at Curtin University and a practising clinical counsellor. 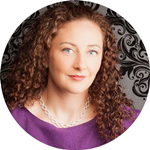 She has completed a BHSc in Health Sciences at the University of Western Ontario (2001), a Postgraduate Diploma of Ethics (2002), a Master of Forensic Sexology (2004) and a Master of Counselling (2014). Amanda coordinates and teaches evidence-informed health practice to more than 2200 students annually in the Interprofessional First Year program of Health Sciences. Amanda’s private practice focuses on couples and grief and loss. Providing her clients with the most up-to-date and evidence-based care is imperative to her, and she has a strong focus on EBP, ethics and communication. Amanda has received numerous accolades for her work, including NifNex 100 Most Influential Business Owners, a Telstra Business Award nomination and a Telstra Business Woman of the Year nomination. Dr Jane Warland is a Senior Lecturer in the School of Nursing and midwifery at the University of South Australia (UniSA). She worked as a midwife from 1988 to 2007, and gained her PhD from the University of Adelaide in 2007. Jane was appointed as an academic staff member in the School of Nursing and Midwifery in February 2008, and teaches a foundational research course in the undergraduate midwifery program. Her own program of research is STELLAR (stillbirth, teaching, epidemiology, loss, learning, awareness and risks). 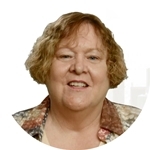 Jane has a track record in research using qualitative, quantitative and mixed methods. She has a strong interest in research ethics and has served as a member of the UniSA institutional human research ethics committee since 2009. Jane has written a number of book chapters about research — she has more than 45 publications, including books, chapters and peer-reviewed journal articles. 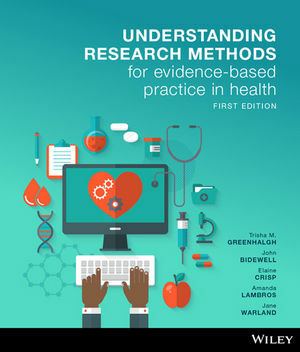 Students can purchase their Greenhalgh interactive textbook from Wiley Direct: Understanding Research Methods for Evidence-Based Practice in Health, 1st Edition.